Troma's "Class of Nuke 'Em High". My first feature film gig, with tons of FX, most of which I have no photos of. A note on the Monster : I didn't make the head ( that was Tom Lauten ), but I did do the body and spent a lot of time inside of the suit during the suit...with no ventilation. The melting head was the first feature film effect I shot, built from a donated plastic model skull, foam latex scraps, and gelatine, with some quick and dirty mechanics. Oh yeah, and the script supervisors hands. 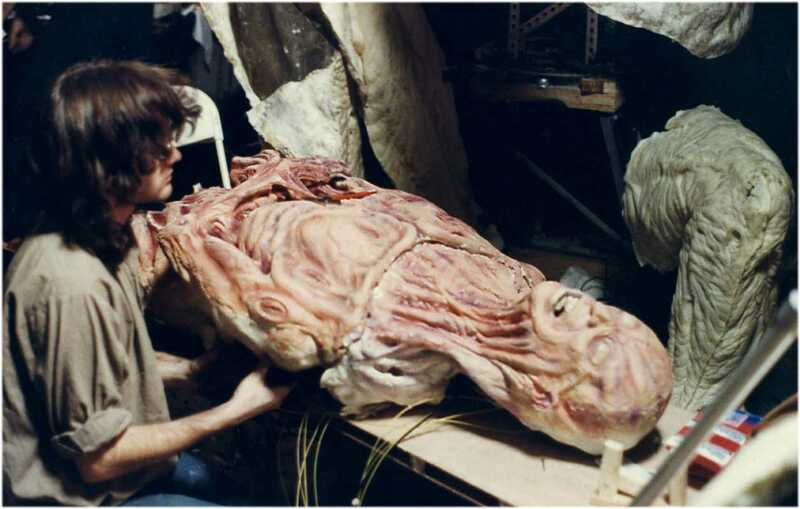 The "eye-popper" was a fiberglas shell (from a lifecast of a totally different actor than played the part) with a flexible urethane insert for the eye are so we could do it a few times. They were so terrified of the ratings board they wouldn't let me use any blood, so it looked a little wierd, but what the hell... It's Troma! "Possesion". An NYU student film that got the director a job with Laurel entertainment, the people who did Tales Fromr the Darkside, Monsters, etc. Strangely enough, my budget was more than double that for Nuke 'Em high. Go figure. This was one of the main characters, Herbert the Walking Talking Killer Chair. More photos soon, there was some pretty cool stuff. "Metamorphosis : The Alien Factor". Now this was a lot of fun. Piles of cool effects, a large and talented crew, something like a budget, a great designer (Ron Cole), and time to do good work. As FX coordinator, sculptor and builder of many of the pieces, and lead puppeteer, this was great fun. The "Spawn" Sculpture . The film was supposed to be, in some odd way, a sequel to the low budget sci-fi cult flick "The Deadly Spawn", hence the big sucker's name. Something over a thousand pounds of clay over a plaster and wire lathe armature, almost every person who walked into the shop had their hands on this sculpt at some point - mostly during the roughing out phase. Winter in New York and the shop was mostly unheated, so just getting the clay on there was a struggle. But this was my baby. And in full living color... The mechanical understructure was built by Ken Walker. Lots of points of movement, and quite an amazing job for the budget. The skins were a combination of foam latex and polyurethane foam for the areas that didn't need much flex. And his faithful sidekick, Checkers. Whipped together at the last minute... If I remember correctly, Paul Reilly sculpted the head, but I did the rest. And finally, the good Doctor, before he got big and slimy. Although not exclusively, I had a large hand in the sculpting and made 'im work. While I was working on Metamorphosis, I was also supposed to do the Toxie makeup for The Toxic Avenger 2 & 3. However, the production office coordinator thought her boyfriend might want the job (he didn't) and told me a contract meeting had been, um, rescheduled. So, alas, it never got past this maquette. This was a forced perspective (1/4 scale in the front, 1/24th in the back) miniature set, with a 1/24th scale car carrier truck I did recently. The cars were diecast, which were repainted and detailed. The truck was a combination of kit-bashed (the cab) and scratchbuilt. I built a bunch of modular levels for the truck, so that they could be stacked higher and higher and composited into the shot. It was for the Capitol One Auto Finance annual report. All this in only 4 days. I only wish they hadn't decided to shoot it backlit, there was a lot of really nice detail on the truck. This is just sort of dumb, but so are adults on halloween. Only a thumbnail, it would be too embarassing otherwise.